China took another step on its long march to a permanent orbital outpost with the launch of the Tiangong-2 orbital module from the Jiuquan Satellite Launch Center. The launch, conducted by a Long March 2F – took place at 14:04 UTC from the 921 Launch Pad of the LC43 Launch Complex. The new orbital outpost will enable the crews to remain in orbit for 30-day missions. Original built as a back up to Tiangong-1, TG-2 is expected to be identical in size to the previous Chinese station that was launched in 2011. 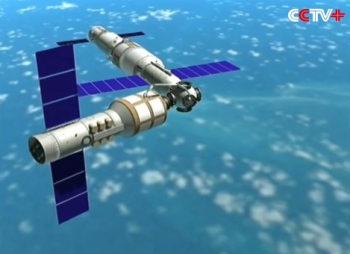 The original plan was for Tiangong-2 to be launched at the end of 2013 or early in 2014. 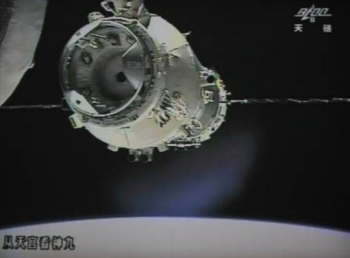 However, following the successful flights to Tiangong-1, China changed the original roadmap. That path involved the new orbital module being used to test technologies that will be essential to the future Tiangong modular space station, the first module of which – the Tianhe Space Station Core Module – will be launched in 2018. The flow towards launch processing picked up the pace when the Tiangong-2 left it Beijing facility on July 7 – arriving at the launch site after a two-day train journey. 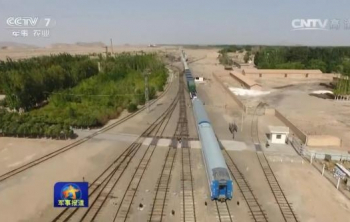 The Long March-2F/T2 that was used to launch Tiangong-2 left Beijing on August 3 by train bound for Jiuquan and arrived at the Satellite Launch Center on August 6. The rocket stages were then transported to the vertical assembly building and were subjected to initial testing to verify that no damage was suffered during a train ride to the spaceport. Electrical and autonomous tests followed, ahead of mounting the first stage on the mobile launch platform that transported the rocket to the 921 Launch Platform on the LC43 Launch Complex. After the first stage was secure on the mobile launch platform, engineers integrated the first of the four lateral strap-on boosters and then stacking operations moved on to the second stage. In the meantime, Tiangong-2 was being prepared in a separate clean room. 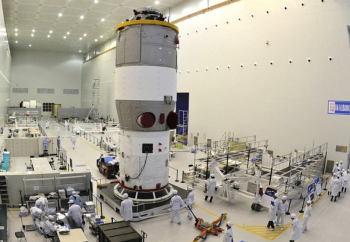 After the orbital module was equipped with all necessary items and cargo for its mission, Tiangong-2 was integrated on the launcher adapter and surrounded by the protective fairing. The stack was then transported to the vertical assembly building and integrated into the launcher. The Long March-2F/T2, with the new Tiangong-2 orbital laboratory, was transported to the launch pad on September 9. After being secured to the launch pad, and all umbilical connections were made, the rocket was ready to take a launch rehearsal that took place on September 11. Having an increased payload capacity, the new Tiangong-2 space station will use its improved living conditions to verify key technologies, such as on-orbit propellant resupply using the new Tianzhou logistics vehicle. Tiangong-2 has a length of 10.4 meters, a diameter of 3.35 meters with a maximum diameter of 4.2 meters. Launch mass is 8,600 kg. TG-2 will also be used to conduct space science experiments on a relatively large scale compared to China’s previous efforts. The new station is equipped with a new robotic arm and will be accompanied by the small Banxing-2 satellite for technology demonstrations. It will also capture images of the new station in orbit. Tiangong-2 will be launched with 14 types of experiments that will focus on cutting-edge technologies such as space materials science and space life science. The station is equipped with a gamma-ray detector (POLAR), a space-Earth quantum key distribution and laser communications experiment to be used in conjunction with the Mozi ‘Quantum Science Satellite’ and a liquid bridge thermocapillary convection experiment and a space material experiment. Also included is a stereoscopic microwave altimeter, a space plant growth experiment, and a multi-angle wide-spectral imager and multi-spectral limb imaging spectrometer. 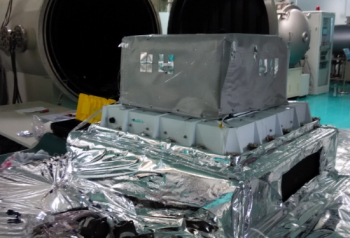 Onboard TG-2 there will also be the world’s first-ever in-space cold atomic fountain clock. Also onboard are a range of payloads developed by the National Space Science Centre (NSSC) under the Chinese Academy of Sciences (CAS) with collaboration from the University of Geneva in Switzerland. POLAR’s development included PSI in Switzerland, who built all electronics except of power supplies and the fast logic. The collaboration also includes NCBJ from Poland. This is the POLAR project, Gamma Ray Burst hard X-ray polarimeter. POLAR will use the Compton Scattering Effect to measure the polarization of incoming photons. POLAR makes no attempt to do a precise localization of the GRB in the sky. This greatly simplifies the design of the detector. Currently, special purpose satellites like SWIFT can provide this information immediately. Many future satellites will have similar capabilities. To complement this, POLAR can roughly localize strong GRBs independently and with sufficient precision for a stand-alone measurement. Launched together with Tiangong-2 is the Banxing-2 satellite. 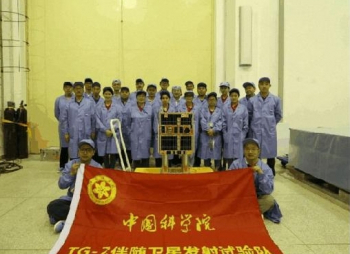 This small 40 kg cubic satellite will be used to take images of the new Chinese orbiting laboratory until a distance of 500 km, and to monitor space debris using a 25 Megapixel high-resolution full-frame visible light camera and fisheye cameras. The satellite is equipped with three GaAs solar cells and lithium-ion batteries. For orbital maneuvering, the satellite will use a LPG propulsion system developed by the Shanghai Institute of Space Propulsion. 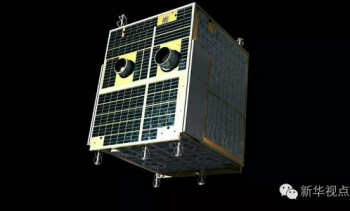 Banxing-2 was developed by the Chinese Academy of Space Technology and Applications Engineering Center on behalf of the Chinese Academy of Sciences. 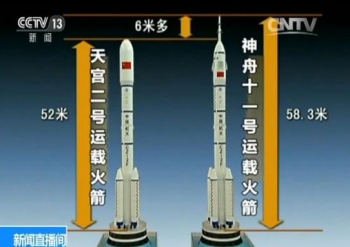 It can be expected that Tiangong-2 could receive two manned missions, Shenzhou-11 and Shenzhou-12. For this to happen, China has to successfully complete a resupply mission with the logistics carrier Tianzhou-1 next April. 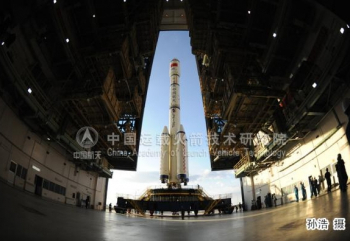 Shenzhou-11 will be launched in October with a crew of two. The main objective of the mission is to break the actual Chinese in orbit permanence record. The crew of Shenzhou-11 will stay on Tiangong-2 for at least 30 days before returning to Earth. 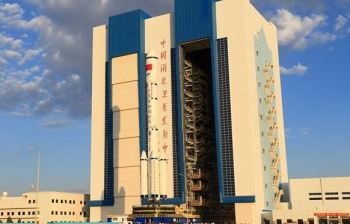 Tiangong-2 will then be boosted to a higher orbit until April 2017 when a Long March-7 rocket will launch from Wenchang with the first Tianzhou carrier with more fuel and water to Tiangong-2. After an automatic docking, the Chinese orbital outpost will be refueled and if all goes according to plan, will be ready for another manned mission. We can expect that Shenzhou-12 can be launched in the second half of 2017 with a crew of three. The mission of Shenzhou-12 will be shorter of that of Shenzhou-11, but we might see an EVA from Tiangong-2 in another important step for the construction of the modular space station. China will have to gain more extravehicular time before committing astronauts to help the construction of the modular station, and Tiangong-2 will be a perfect platform for that. 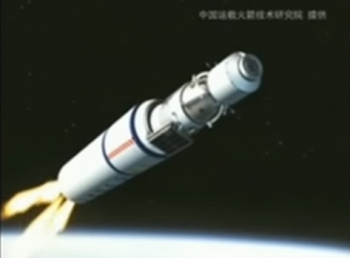 Tiangong-2 was launched by the Long March-2G/T2, a variant of the launch vehicle usually used for the manned Shenzhou program. 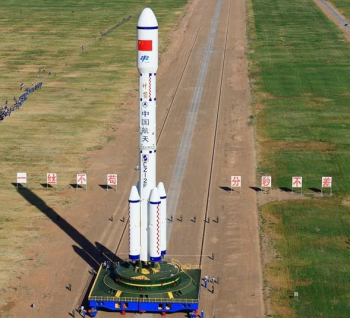 This launch vehicle, developed by the China Academy of Launch Vehicle Technology under the China Aerospace Science and Technology Corporation, is different from the original ‘Shenjian’ (Devine Arrow) version that was developed from the Chang Zheng-2E launch vehicle. 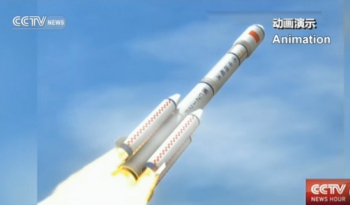 That rocket, in turn, was based on the proven flight technology of the Chang Zheng-2C. Conceptual design work on the CZ-2E launch vehicle began in 1986. The rocket was entered into the world launch services market following a successful test flight in July 1990. In order to meet the requirements of the rendezvous and docking mission, the Chang Zheng-2F endured nearly 170 technical modifications and utilized five newly developed technologies. A substantial difference for this rocket is the absence of the launch escape tower, a more bulbous fairing and an improved separation sequence. For this mission, the fairing is 12.7 meters long and 4.2 meters in diameter. An additional characteristic of this rocket includes the fact that is capable of more precise orbit insertion accuracy. This is possible with the introduction of improved navigation systems and complex guidance system that features real-time inputs to the rocket to orbit parameters and uses GPS data outside the measurement error correction parameters so as to achieve double redundancy. Also, more propellant is loaded on the boosters, thus increasing the firing time. Like the CZ-2F/G, the CZ-2F/T2 is a two-stage launch vehicle that uses four strap-on boosters during the first stage phase. Overall length is 52.0 meters with a 3.35 meter core stage and a maximum diameter of 8.45 meters. At launch, it has a 493,000 kg mass, capable of launching 8,600 kg cargos into a low Earth orbit. For the CZ-2F launch vehicle, the LB-40 strap-on boosters have a length of 15.326 meters, a diameter of 2.25 meters, a gross mass of 40,750 kg and an empty mass of 3,000 kg. Each booster is equipped with a fixed nozzle YF-20B engine that consumes UDMH/N2O4 developing 740.4 kN of sea lever thrust. Burning time is 127.26 seconds. The L-180 first stage has a length of 28.465 meters, a diameter of 3.35 meters, a gross mass of 198,830 kg and an empty mass of 12,550 kg. It is equipped with a YF-21B engine pack that consists of four YF-20B engines that consume UDMH/N2O4 developing 2,961.6 kN of sea lever thrust. Its burn time is 160.00 seconds. The L-90 second stage has a length of 14.223 meters, a diameter of 3.35 meters, a gross mass of 91,414 kg and an empty mass of 4,955 kg. It is equipped with a YF-24B engine pack that consists of one fixed nozzle YF-22B main motor with a swiveling vernier four YF-23B engines. The engines consume UDMH/N2O4 developing 738.4 kN (main engine) and 47.07 kN (vernier) of vacuum thrust. Total burn time is 414.68 seconds (301.18 seconds burn time for the main engine). Inaugurated on April 24, 1970 when the CZ-1 Chang Zheng-1 rocket launched the first Chinese satellite, the Dongfanghong-1 (04382 1970-034A), the Jiuquan Satellite Launch Center, in Ejin-Banner – a county in Alashan League of the Inner Mongolia Autonomous Region – is the first Chinese satellite launch center and is also known as the Shuang Cheng Tze launch center. With ignition taking place at 14:04UTC at the end of the usual countdown in Chinese, the rocket began its journey into the Jiuquan night sky. The separation of the four strap-on liquid boosters took place at 155 seconds into the flight. The separation was followed by a stabilization process four seconds later, with the first stage separating right after together with stage two ignition. Fairing separation took place 3 minutes and 35 seconds into the flight. The second stage pushed Tiangong-2 into orbit, ending its performance at 9 minutes and 42 seconds. Spacecraft separation came a few seconds later. Once in orbit, Tiangong-2 will maneuver itself into an orbit about 380 kilometers above the Earth for initial tests. It will then transfer to a slightly higher orbit about 393 kilometers above Earth when Shenzhou-11will ferry two astronauts to the lab next October. The site from where the rocket departed includes a Technical Centre, two Launch Complexes, Mission Command and Control Centre, Launch Control Centre, propellant fuelling systems, tracking and communication systems, gas supply systems, weather forecast systems, and logistic support systems. (Images via CNSA and CCTV).